When looking at digital black and white photography, an important aspect is the print quality that your printer/paper/ink combination is capable of. We’ve looked at a lot of printers and ink systems for monochrome work and felt we wanted a test image that would enable quick comparisons. This short article (with download) discusses an image Keith Cooper created specifically for this purpose. It’s even been used for setting up the screen of an iPad. 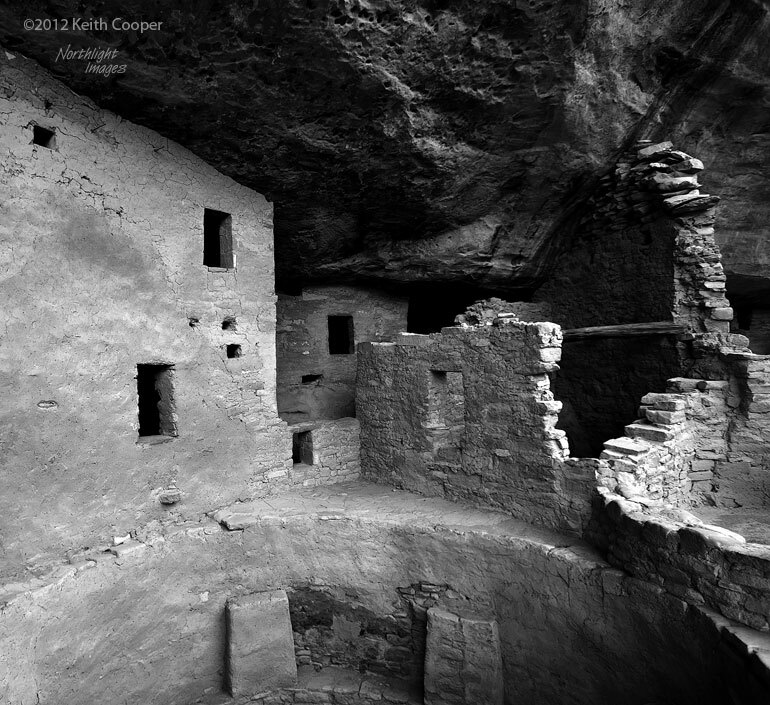 The test image below is based on two of my landscape pictures that show up different aspects of B/W print quality. By using a known test image, you can get a ‘feel’ for a paper/ink combination, which I often prefer to use for new works over any ‘soft proofing’ set-up. See also our page with more general (colour) test images. 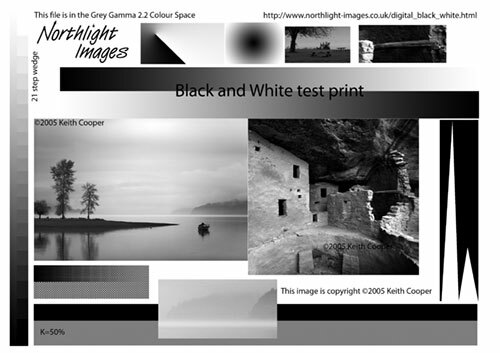 The light sky in the Hood Canal picture (LH image) has very delicate shading to bring out the subtle cloud and mist features, while the dark shadows in the Anasazi ruin (from Mesa Verde) are a harsh test for any digital black and white print set-up. The windows are solid black, but there is fine detail in most of the deep shadow. For example, the shadow in the bottom RH corner of the ruins has a lot of detail in the range K=92-100% (black). That corner really shows up any obvious steps or non-linearity in deep shadows. You should be able to read the black text of the copyright notice in that area of the print. In the two small sections of image at the top right hand side, the bench should be quite clearly visible and there should be visible detail on the wall behind the wooden beam. The graduated blocks and 21 step wedge (5% increments) also give a more absolute test. 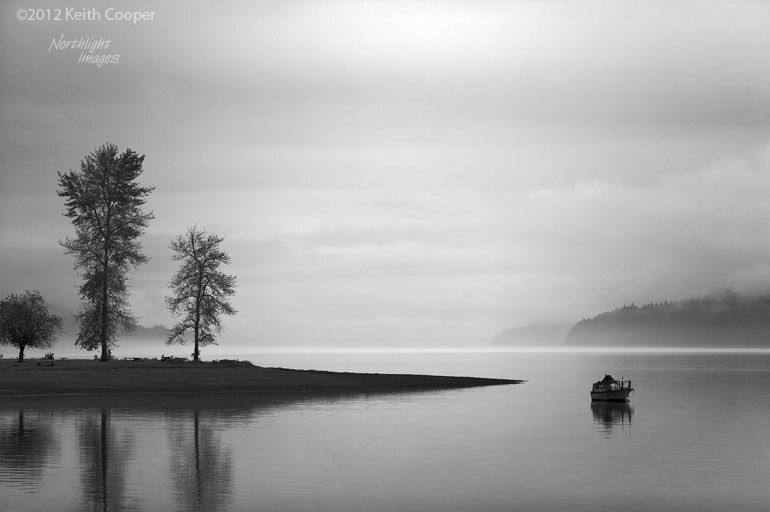 In the small sample from the Hood Canal image at the bottom, there is meant to be some visible noise – it is part of the image. Here are larger versions of the two photos. The solid black wedges at the right hand side of the test print tend to show up any over-inking or smudging, although I’d always suggest doing a nozzle check of any inkjet printer before doing the test print. Modern printers with their very fine droplet size can be misfiring on several nozzles without making the obvious lines that you used to see on older inkjet printers. The file is in the gray gamma 2.2 space. My original version is created as a 16 bit file which ensures that the 8 bit version here should have smooth transitions (Photoshop actually introduces a small amount of dither in the 16 bit -> 8 bit conversion to improve the transitions). The file on this site is a JPEG at a Photoshop quality setting of 10, so should be good enough for the test. The image shows up colour casts and uneven steps very well. You may want to make sure that your monitor is pretty well set up and adjusted (calibrated) too, since the image will show up deficiencies there as well. April 08 – we have slightly updated versions (A4 and US Letter) designed to be used with the X-Rite ColorMunki and QuadToneRIP for creating black and white icc profiles. 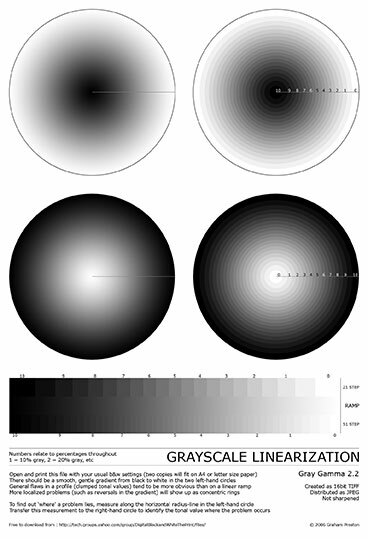 More details on our ColorMunki for black and white printing page. Two other parts of the image that show up problems are the circular patch and the checker pattern. 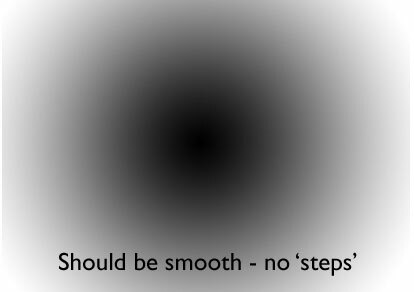 This circular patch shows up steps or non linearity in the greyscale that are too subtle for the longer horizontal greyscale ramps. Do note though that this is probably the harshest aspect of the whole test image. This part of the image may be the only area where you see any visible non-linearity, but if it isn’t smooth then the printer/driver/paper/ink combination fails for -my- own work. The checker pattern should ideally show detail all the way down to the area indicated below. Here is the 11″x2.5″ version of the test image. It’s one I use to save paper when wanting to do several tests. It has all the key elements of the A4 page. Graham Preston has produced a test image aimed at showing up more details of non-linearity. Graham’s test image (300 ppi 13×19 cm) has circular gradients on it, both positive and negative. Unlike the example in my own test image there are also stepped versions that allow you a more precise measurement of where the non linearity is in your prints.